There are always new social media networks and we are doing our best to invite experts to educate us on how to succeed on all of them. Today we are talking about Snapchat. 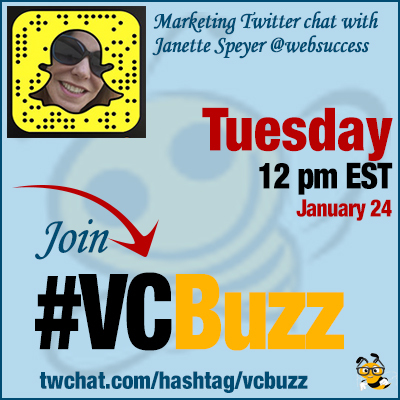 Janette Speyer cofounder of WebSuccessTeam and Hot Ice Media. Q1 What is Snapchat? How does it work? What makes it different from everything else we already have? Snapchat is an app that allows you to share your everyday life using a quick, easy and fun platform. According to @eMarketer 45% of all Snapchat users in the U.S. are between the ages of 18 and 24. What differentiates Snap from the rest is the casualty of the app. It makes it easy to share what you’re doing. Snapchat allows you to connect with your customers in a very personal and human way. Your picture disappears after a day! This can keep visitors wondering and mysteriously interested. But best of all, snap has filters that make it fun. Check these out! That is the biggest differentiator. It has total entertainment value. This is the appeal for brands. More and more people are using Sanpchat so I expect the demographic to change in the not too distant future. Q2 How can one get noticed on Snapchat? How to build following there? Snap is a very personal app, so you need to be respectful and relevant. It’s a “think before you share” app. The same as with anything else on social media. Be authentic, be real, be human and mostly show you care. Think TV show or mini show. It is like doing a livestream video but you have to be more casual. 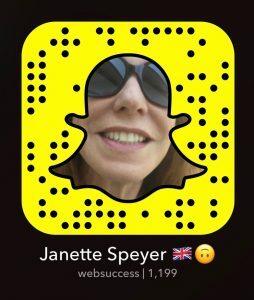 You can build a following by sharing your snapcode on your other social media platforms. I always find brands to follow to get ideas. Here is an article on how to search on Snapchat. But she can be in yours. My daughter got me on Facebook years ago, but I wasn’t her “friend”. Kids today love teaching their parents. LOL. I don’t know anything, right? Q3 How can a business succeed on Snapchat? You have to think outside the box to succeed on Snap. Think selling, think engagement. Think dynamic and not static messaging. Create content that is fun and relatable. Check out the trending filters and use them. That is a unifying force on Snap. By dynamic, I mean, talk to people, relate and tell your story. See @stringstory’s educational page. Keep in mind that Snap skews to a younger audience. I typically follow the Discover channel to get ideas on how to engage. 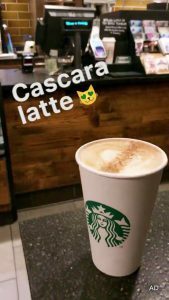 You also can utilize Snap geo filters to reach a target audience via a specific location. Practice by sharing your Snap to the “my story” section. Monitor engagement with engagement with Snapchat analytics. There are a few platforms out there. Q4 Are there any inspiring examples of businesses already using Snapchat? Data from Sumo Heavy found that 18.2% of US Internet users have purchased products directly via social. Starbucks is doing very creative snackable content. 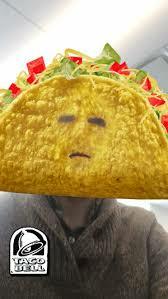 Taco Bell used Snapchat last year and created a wildly popular filter. Presently it’s expensive to advertise on Snapchat but you can create geofilters for your local business for a reasonable price. IMO, the best way to use Snapchat for business is to hire influencers. They can tell your story and they have a following. Take a look at @carlosgil for business tips and ideas. Watch his style. Snapchats tends to be more casual than regular content. You will want to measure your success. Here are recommended analytics platforms by @stringstory. Q5 Are there any Snapchat tools yet? Anything you are using? The best ones are the Filters, they’re fun and can make regular boring snaps a lot more fun! Swipe right on your Snap story to add a geofilter based on your location. It shows people where you are with a fun graphic. You can also use emojis, bitmojis in your Snaps as well as creating your own stickers! Always something new on this app! Try it yourself, here are some of mine. Take it for a spin and let me know. I believe Snapchat opens up a whole new approach to marketing. We are testing several programs. I will keep you posted. A lot of this is how you approach the strategy. 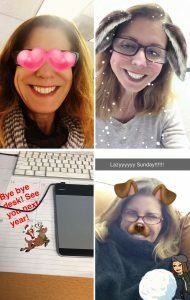 Enlist your employees to snap for you. It’s been a pleasure chatting today. Follow me on Snapchat I will follow you back and let’s have some fun at work!